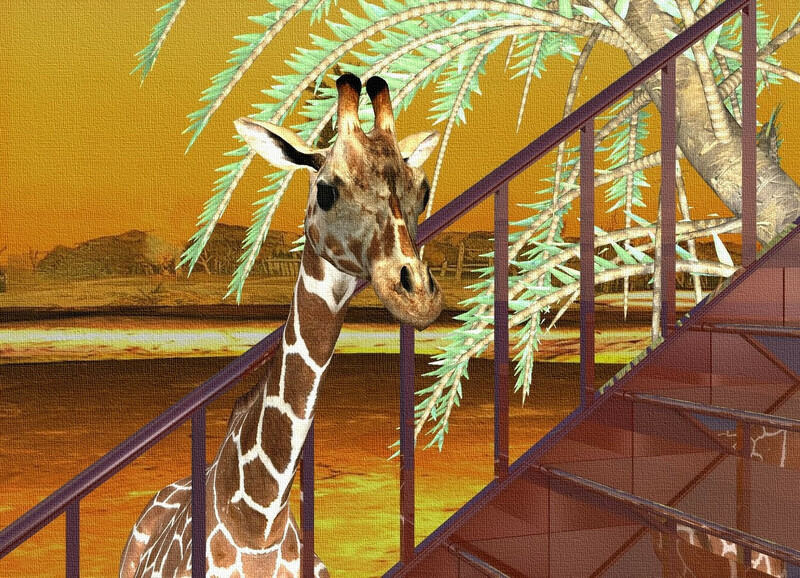 Giraffes may find stairs confusing and hard to navigate. Input text: 10 foot tall invisible window faces right. it is -.1 foot in front of and -.1 foot left of 7 foot tall invisible cube. a 10 foot tall shiny staircase is in front of the cube. backdrop is [desert]. a 8 foot tall giraffe faces right. it is -1.9 foot right of the window. sun is black. ambient light is silver. a shiny forest green date palm is behind and left of the giraffe. it faces back. a gold light is above and right of the giraffe. This started out as SUCH a different scene!